Trying out a new app! My first problem when I decided to dip my toes back into the blogosphere pond was ‘How do I find my own blog?’ I’m on my third browser since I last blogged, and have lost loads of bookmarks. I eventually found it through my Twitter account! So here I am. Back at work after FOUR weeks off because of stress! Thought All Saints’ Day would be make an appropriate day to start over – Communion of Saints a bit like the blogosphere – celebration of unity within diversity, of openness and sharing, of being yourself within a community of others. Have to get out of bed first, though. Perhaps more later. This parable makes both TUC members and CBI members lie awake at night…! – and we like it when we feel we can put ourselves higher up than someone else…! – and none of it has any real/lasting basis…! God puts every part of his creation on the same level! – and that includes us…! When my daughter Alison announced the acquisition of her first tattoo, I was a bit taken aback. Taken aback, not by the fact that she wanted a tattoo – part of being a parent these days is about getting to expect the unexpected – no, I was taken aback by her choice of subject matter for the tattoo. She didn’t want any words – love, joy, peace; mum, dad, Milo. She didn’t want a heart, or a star, or a butterfly. 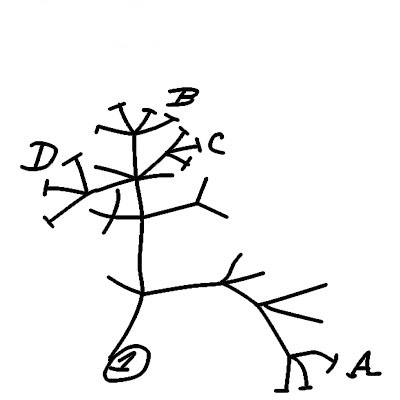 She wanted an image of Darwin’s First Tree of Life! This ‘branching out’ of different species from a common ancestor lies at the heart of Darwin’s theory of evolution. One species will, as it were, split into two, one going one way and developing in its own way, the other going another way and developing in its own way. So the natural world diversifies, and the myriad different forms of plants and animals emerge. This is not, of course, where the problem lies for those who don’t accept the whole evolution thing. It’s not the description of what happened that is a problem, but how it happened, what caused it to happen. Evolutionists would say it was due to ‘natural selection’; and creationists would say that it is ‘the will of God’ (To simplify things greatly!). – but what about the cancer cell or the mad dog? – or the terrorist or the earthquake? Why would God create (or allow to be created) all the destructive things we so often come across in life? Are they meant to be a test? …or a challenge? …or a punishment? Are they a reflection of humanity’s ‘fallen’ nature? You could begin to think that this creator God may not be the kind of God we would want as a friend (never mind an enemy)! There is an acknowledgement here that the process of creation might not yet be finished and that the story has still not yet ended. This does not mean that we look like God, or that God looks like us! It means that we share with God that thing that makes God God; – that that ‘God thing’ is reflected in us. But what is the ‘God thing’? What is it that makes God God? What is it about him that is most typically God-like? Power? Wisdom? Remoteness? Invisibility? Knowledge? Love? Strength? What do you think? I think it’s ‘freedom’. I think that it’s God’s ability to ‘do what he wants’. I think that the most God-like thing about God is that he answers to no-one else, and that there is nothing else anywhere that can stop God being God. God ‘said’, ‘And it was so’. What God says, happens! And nothing can stop it from happening! Total freedom from any restraint. And that, I think, is his ‘image’, his defining characteristic. And it’s that freedom that he imparts to his creation, the freedom to ‘be’, the freedom of a human body cell to be cancerous, the freedom of a person to take another’s life, the freedom of the earth’s tectonic plates to shift, and cause earthquakes. Now that would be scary, if it were the end of the story. But we’re not at the end, we’re just partway through the process. And the process is driven, not by randomness, not by whim, not by accident, but by love. God’s word is spoken in love – his will is achieved by love – and creation is perfected through love. I went to London last Thursday – for a meeting with a General Synod working party – about the formation of a “professional association” for clergy in the CofE – pretty boring stuff for ordinary mortals. The meeting was in the Covent Garden area, not far from Trafalgar Square, and an area with quite a lot of theatres – I arrived there a bit early for the meeting so I popped into St Paul’s Church (Covent Garden – the ‘Actor’s’ Church!) – a pretty unremarkable church. But when I went in I was hit by the smell of incense! It was the morning after Candlemas, and I guess they’d had a service there the evening before, so the smell was still quite strong. I love the smell of church incense – and I was instantly transported to somewhere wonderful! I find that many smells have a similar effect on me. They transport me somewhere. I remember my first trip the other way round: from London to Manchester – interview for my first curate’s job – and when I stepped off the train at Manchester Piccadilly, the smell of hot oil and diesel hit me – and I was transported back to the steel works in my home town – transported back by smell alone! I think that our sense of smell is connected directly to our memories – hardwired in our brains. So I think that it is significant that Jesus, in today’s gospel, when he tells us what we are, he tells us that we are to be two things that impact directly upon the senses: salt and light! You will note that he does not tell us to be preachers, or teachers, or philosophers – people who make their impact upon the minds of others – instead we are to make our impact upon others’ senses (specifically taste and sight). Both salt and light are pretty hearty things as far as our senses are concerned. Salt – both in deficiency and in excess – can either make, or totally ruin, a meal. And light – a vital component for all sight – without light we are all in the dark – and there is no sight, nor colour, nor vision. We, as followers of Jesus, are to be salt and light – giving flavour and colour to the world – and hitting people where they know they’ve been hit (as it were) – without, of course, getting up their noses! We are, in other words, to by-pass their minds, and aim for something deeper, something much more visceral within them – to be something that tickles their taste-buds and lights up their lives. Notice that in this Gospel account, Jesus goes straight on from telling us that we are salt and light, to talking about the Law (the OT Law, the Law of Moses). The Law was a preoccupation for the Jews of Jesus’ day (as indeed it is for those of today, of course), and it was a particular problem for Matthew (the writer of the Gospel). Matthew is writing (particularly) for Jewish converts to Christianity – who might be a bit loath to tinker with what has hitherto been at the heart of their faith – The Law. The problem with the Law was that it did not work. It did not create good and holy people. It created lawyers! And the task of the lawyers was to find ways of getting around the law (in both senses of ‘getting around’!). And it all became a kind of game. The Law says this, the Law says that – but this bit maybe affects that bit – so you can do this, but not that – but if you do that, then maybe you don’t need to do this. The Law became the subject to interpretation. It became an intellectual exercise – a mind game. Jesus knew that the Law would not (could not) save anyone – but he also knew that it was a gift from God – a gift that was to draw us closer to Him – something to be lived, rather than obeyed. The real law lives in our guts, rather than in our heads. It is all about ‘sensing’ the ‘rightness’ of the written law – and translating that into our everyday thoughts and actions – it’s about seeing the light and tasting the truth. We are salt for the earth! We are light for the world! I don’t know how familiar you are with Monty Python’s Life of Brian – a spoof loosely based around the life of Jesus. It was released in 1979, with some controversy – it was even ‘x’ rated at one stage by quite a few local authorities! I remember seeing it in London not long after it came out. I had to cross a picket line of Christians in order to get in! It starts with a star, moving across the sky, followed by three men on camels; and continues with these three riding down a dark back street, and arriving at a hovel, with mother and child. “Whad do yu want?” screeches the mother (played by Terry Jones). “We were led by a star”, say the first wise man (John Cleese). “Led by a bottle more like”, retorts the mother. Eventually the three wise men get around to offering their gifts to the child: gold, frankincense and myrrh. The mother is not to sure about the myrrh. The third wise man (Michael Palin) has to explain that it is a valuable ‘balm’, which she immediately thinks is some kind of wild animal – until the wise man explains that it is an ointment! She gladly accepts the gold and the frankincense – but is diffident about accepting the myrrh. Anyway – the three wise men worship at the manger, and exit, only to re-appear almost immediately: to reclaim all three gifts, and dash back out! The camera follows them… – as they cross to the other side of the alleyway to another hovel, this one surrounded in light, and peace, and with the baby Jesus, meek and mild, asleep on the hay. But the film continues to follow the mother, Mandy Cohen, and her son Brian. “What is myrrh, anyway?” Mandy screeches in those opening moments of the film. ‘What and why?’, we too may ask. It seems that St Matthew was playing a little fast and loose with the Old Testament in his story of the wise men. Gold and frankincense were to be expected, as was the wealth of the nations, as indeed were the camels – we have it all in the first Epiphany reading, from Isaiah 60. – but what about the myrrh? Why did Matthew feel he needed to add that extra detail into his story? If you read a biblical commentary, it will tell you that it represents Jesus’ future death and burial. Myrrh was indeed used by the Egyptians when embalming bodies; myrrh is offered to Jesus on the cross as a sort of pain-killer; and myrrh was brought by Joseph of Arimathea to Jesus’ tomb as part of the burial. All very plausible. But all neatly evading the fact that, in a Hebrew context, myrrh was all about love – and not just spiritual love! It was the Old Testament equivalent of Chanel No.5! Myrrh is mentioned in one particular book of the Old Testament, exactly TWICE as many times as in all the other 38 books put together! And that book is the ‘Song of Songs’ – sometimes called the ‘Song of Solomon’ – a love song, and quite clearly a love song! Could myrrh be a symbol of that love? You are unlikely to hear any of the Song of Songs ever read at a Sunday Eucharist – it just doesn’t figure in the Sunday lectionary scheme. But part of it IS one of the readings set for the feast of St Mary Magdalene! Now, I’m not trying to get all Dan Browne-ish – there is no DaVinci Code, Magdalene, plot in all this. But I do think that there is a misreading here of the significance of ‘myrrh’ in the Epiphany story. There is a much more obvious meaning. I think the myrrh may be an affirmation of Jesus’ down to earth humanity, of his intimate involvement in the life of this world, of his immersion in love with the humanity of us all – rather than a reference to his death! waiting for the one train through that day…! – no one would use a prime piece of real-estate for an execution site…! It was, more probably, maybe, a rubbish dump…! 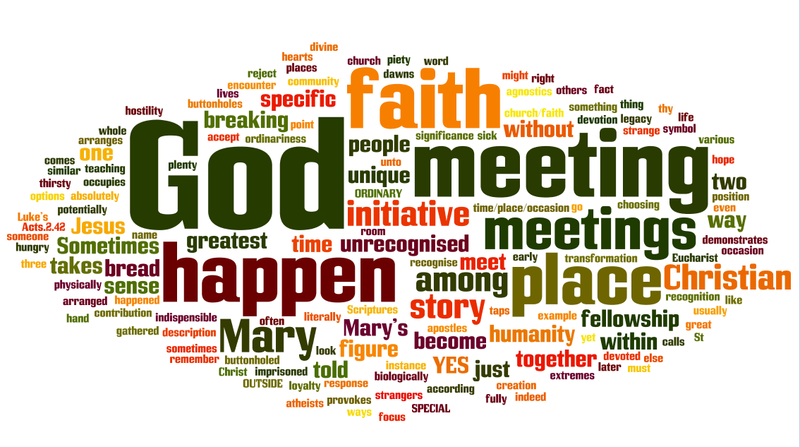 A Wordle of tomorrow’s sermon! Sometimes we do look at things, and people, and what we see does make our hearts rejoice – but not always. The recent re-emergence into the news of Jon Venables, one of Jamie Bulger’s killers, from all those years ago, also brought out again those eerie photographs of both of the killers, aged 10. Eerie, because to look at those photographs again, knowing what we know now, is really quite disturbing, and certainly not something that would make our hearts rejoice. And yet they are two human beings, created by God, two human beings who have committed a terrible act – but is there anything left there to make our hearts rejoice? It is one of the great clichés of the Christian faith, that “We should hate the sin, but love the sinner!”, but can we do that with Thompson and Venables? Or, indeed, with Peter Sutcliffe or Myra Hindley or Harold Shipman? Sin obscures our vision of the person of the sinner, so that when we see them, we see not the person, but the sin. The sin ‘clothes’ them with a new identity, disguises them. This is obvious (and understandable) in the case of Thompson and Venables (and Sutcliffe/Hindley/Shipman), but it’s also true of all people. We all carry our own sins and shortcomings with us, our own loads. And these ‘loads’ become part of our own ‘self-image’, and of our image of other people. We become ‘clothed’ what we have done, the good as well as the bad, but especially the bad! We see the sin, in ourselves and in others, and that obscures our vision of the person beneath. and from whom no secrets are hidden…” – God seeing all our innermost faults, all our ignoble thoughts and words and deeds. But God is not fooled by what he sees! He sees the sin, but he does not let that obscure his vision of the sinner. He sees through our ‘clothing’, our mantle of sin, to the person beneath. And he sees in that person infinite possibilities – possibilities for growth and renewal and life. And loving, he gives substance to those possibilities. It is that clear-sighted love, made real, and given substance in the person of Jesus, and through the mystery of the cross – it is that unobscured love of God that rids us of our outer garment of sin and allows us to stand before him as his beloved people. He sees and his heart rejoices – even though it is that heart that also knows the pain of the cross. Our vision of what is real and what is not real, of what is true and what is not true, both in ourselves and in others, makes us what we are. Our vision is clouded by sin, so clouded that we find it hard indeed to see through that cloud in order to love what we see.